International Development Secretary Penny Mordaunt, who used sign language to open the event, called on the sector to move from rhetoric to action ahead of the congregation. 301 organisations and governments signed the Charter for Change – an action plan to implement the UN International Convention on Disability. Nine national governments committed to passing or formulating new or revised laws to give people with disabilities greater rights in the countries in which they live. 18 governments and other organisations committed to new action plans on disability inclusion. 33 governments and other organisations pledged to specifically support more people with disabilities affected by humanitarian crises – this includes the Australian government who will give $17m to support disability inclusive action in response to the Syria crisis. Nine organisations and governments, including USAID, The World Health Organisation and UNICEF, have joined with the UK government to form the global partnership on assistive technology. It is aimed at transforming access to, and the affordability of, life changing devices and basic technology, like wheelchairs and glasses. Seven UN agencies attended the Summit and they committed to change the way they include people with disabilities into their work. UNICEF will help an additional 30 million children with disabilities gain a high quality education by 2030 through programmes in more than 140 countries. 18 governments have committed to improve the way children with disabilities learn and invest in teacher training. • By 2021, 80percent of UN Women’s country programmes will include a focus on women and girls with disabilities. • This year, the UN Trust Fund to End Violence against Women will spend $3m on nine programmes which will reach 8,000 women and girls. Nine African governments have committed to creating safety nets to ensure that people with disabilities are not forgotten about in their societies. 19 governments, businesses and other organisations have also pledged to develop the skills of people with disabilities and help them access decent work. “It is fantastic to see such ambitious commitments made from countries and organisations from around the world at today’s Global Disability Summit," said Penny Mordaunt MP. 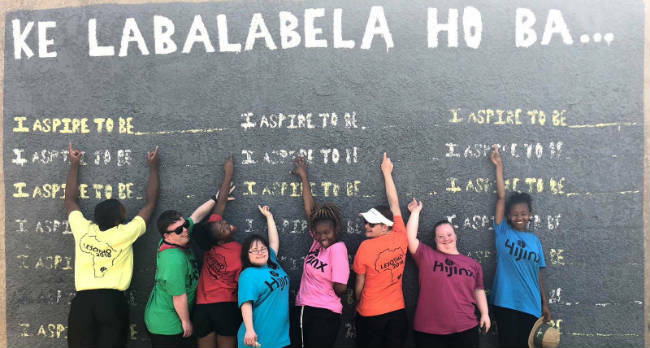 "But, if we are going to help people with disabilities to fulfil their true potential, today cannot just be about words – it has to be about action." "That’s why we need to hold ourselves and our partners to account and make sure these commitments produce genuinely transformative results for people with disabilities worldwide." The lack of data evidencing disability exclusion has often been used as an excuse to hide behind by policy makers. The Leonard Cheshire Disability Data Portal launched to mark the Summit this week goes someway towards overcoming this justification.